I have a classic car can you cater for people like me? Yes, infact we have a great team, which work with us and we can take on complete restorations to minor issues, we have a lot of experience working with older vehicles so your pride and joy will be in good hands, one thing is for sure you will have a lifetime warranted system which may cost less than an original mild steel one, and sound so much better. We offer a comprehensive guarantee on all work, and the magnaflow mufflers and tips come with a lifetime warranty, details can be provided on request. Who can I contact out of hours? For any urgent issues only, you are able to contact us on 07915 092 884. Yes. Please contact us to make a booking. Is my vehicle safe in your hands? Yes. Apart from having a full monitored alarm system, we have 24 hour security cameras with remote monitoring via a network. All images and data are stored off-site. YES. Car Sound Exhaust System, LLC., the parent company of MagnaFlow Performance Exhaust is a world leader in the manufacturing of automotive catalytic converters. The production and design techniques of our catalytic converters contribute to Car Sound’s standing as the highest quality and best-valued products on the market. Car Sound Exhaust Systems have been in business for over 20 years and is available from Profusion Customs. The latest additions consist of direct fit catalytic converters for european cars, call us or visit website for details. Yes, all our Cat-Back Exhaust Systems are completely made from stainless steel. Everything from the pipes, hangers, clamps, mufflers and tips. Tips, unlike our competitors, mufflers, and resonators (where applicable), are “mirror finish”, polished stainless steel. Stainless steel is better looking and will never rust. Nothing looks better or lasts longer than stainless steel even when it is custom built on the car, stainless steel wire is used for the welds. That depends on the type of system purchased, we can supply off the shelf systems that can be installed by you, however, we recommend that a professional installer be commissioned; such as Profusion Customs or one of our appointed dealers to make sure everything is done to spec and complements the lifetime warranty. Can you change my existing system for a Magnaflow? Yes we have all the necessary equipment and pipe bending machines to provide a full custom built system, even if you need up to 4 inches of tube installed, this is always the best option. I have a sport compact car, but you don't offer a cat-back system for my car. What are my options? he “Street Series” universal mirror finish mufflers, equipped with tips, are designed for all sport compact cars in mind. For a full cat-back system we can custom build a system that can be used in conjunction with our “Street Series” and “Race Series” mirror finish line mufflers for a complete cat-back system. In most cases a single exhaust will give you better torque and horsepower. The exception would be a heavily modified engine, however we can build any configuration, so call our technical team for advice. You can purchase MagnaFlow Performance decals/stickers from Profusion Customs, we can make one any size for you. YES, a better performing engine uses fuel more efficiently, if driving conditions and tendencies are similar. Nevertheless, it is not a guarantee. Our mufflers were designed as performance mufflers. MagnaFlow’s diesel exhaust for trucks will see the biggest gains due to our systems’ dropping EGT’s over 150 degrees. It’s different for every car, but typically expected gains are in the average range of 10%. Replacing the muffler/exhaust with a MagnaFlow will help your engine increase power by being able to expel exhaust gases quicker. This creates less workload for the engine, makes it run more efficient, and results in better power. Are MagnaFlow Performance Exhaust systems legal? YES, all of our Cat-Back Exhaust Systems comply with most laws with the exception of the Magnapacks. (Please note, local laws may vary therefore, contact your local law enforcement for specific guidelines.) Our products are designed and tested to meet legal sound level limits; however, when used in conjunction with other products (such as air intake systems or exhaust headers), the overall combined effect might cause particular vehicles to exceed the allowable limits. What is the difference between MAGNAFLOW PERFORMANCE, MAGNAFLOW XL PERFORMANCE, MAGNAFLOW PRO PERFORMANCE, MAGNAFLOW DIRECT-FIT MUFFLER KIT? MAGNAFLOW PERFORMANCE diesel systems are our premium line featuring a POLISHED 100% stainless muffler and mandrel-bent stainless steel tubing with a DOUBLE WALL tip. MAGNAFLOW XL PERFORMANCE is our mid-level performance diesel system featuring a 100% stainless steel muffler and mandrel-bent stainless steel tubing with a single wall tip. MAGNAFLOW PRO PERFORMANCE is our entry-level performance diesel system featuring a 100% stainless steel muffler and mandrel-bent stainless steel tubing. Optional 5â€ diesel tips are sold separately. MAGNAFLOW DIRECT-FIT MUFFLER KIT If you want to get some of the sound, looks and performance of our full cat-back systems, but are working on a budget, consider Magnaflowâ€™s all new 100% stainless steel direct-fit muffler kit. All four lines are 100% stainless steel AND backed by a lifetime warranty. Nothing performs better, looks better, or sounds better than MagnaFlow Performance Exhaust. Our Research and Development Team have invested many years to ensure our products stay competitive and perform the way they should. Our systems feature straight-through flow designs for the ultimate in unrestricted horsepower and torque for big power while maintaining exhaust efficiency. The internal MagnaFlow muffler is designed from stainless steel perforated core, stainless steel wool, and an acoustical absorbent material — superior to fiberglass (which many other manufacturers use). No baffles, chambers, or louvers. No restrictions at all, just straight-through, wide-open performance with a smooth, deep addictive tone and each MagnaFlow stainless muffler has a highly polished mirror finish for a show car look. Our systems give a 20% reduction in bends over your OEM system to provide the power you demand. Car Sound Exhaust System, LLC., the parent company of MagnaFlow has been in business for over 20 years. MagnaFlow mufflers are universal and can be installed on virtually any car with the help of a MagnaFlow “Preferred Installer” the muffler size will be determined with the space available beneath the car. Profusion Customs will be able to advise you on which muffler sizes to use on the cat-back exhaust systems for cars and trucks, so that you can obtain a good idea of what muffler is right for your vehicle. Do you need an offset muffler? This is where your inlet/outlet pipes are located in relation to the muffler. Do you want a stainless steel or aluminised muffler? Answer: The main difference between the two is the outer shell of the mufflers. Stainless steel mufflers have a polished stainless steel shell and are 100% stainless construction. Stainless steel is more appealing and will never rust. Nothing looks better or lasts longer than stainless steel. The aluminized mufflers have stainless internals and necks but have an aluminized outer shell. Moreover, the aluminized steel has only a protective coating which, if scratched off, may rust. Both mufflers have identical internal construction and materials, therefore both offer you a lifetime warranty and will give you that Straight-through Wide Open Performance with no restrictions. No restrictions equal better flow, and better flow equals more horsepower. The bigger the muffler, the quieter the exhaust. We can check for which muffler sizes we use on our cat-back exhaust systems for cars and trucks, so that you can get a good idea of which muffler is right for your vehicle. Don’t be fooled! Bigger is not better! Many people think that having the biggest diameter pipe is the best way to make power. Not true. Due to a variety of factors, extensive testing is required. We’ve dynode extensively and our systems yield optimum power increases. Some manufacturers claim even higher horsepower numbers. It is a fine line to reduce back pressure while maintaining good exhaust velocity. It is not about getting the biggest pipe; it is about getting a more efficient pipe diameter while maintaining exhaust velocity. There has to be a balanced design to enhance the maximum engine output, exhaust gas velocity, and sound. For example, imagine blowing air through a straw (comparing it to a smaller diameter pipe). This would take time to release all the air from your mouth, and you would feel pressure in your mouth while doing so. Now imagine blowing air through a paper towel roll (comparing it to a larger diameter pipe). You will relieve all your air much faster and feel little or no air pressure in your mouth because of the larger capacity of the tube. This is why it is important to get the correct size piping in order to relieve back pressure while maintaining thermal efficiency. Use the guide below when calculating pipe size for custom exhaust work. Keep in mind that the goal is to improve exhaust flow. In most cases, just changing the restrictive OEM muffler and replacing it with the same size straight-through, Wide Open Performance MagnaFlow muffler will do the job. To reduce additional back pressure, the OEM exhaust tubing can be replaced with mandrel-bent tubing of the same size or one size up from the OEM. As a general rule, you can enlarge the pipe diameter of your OEM exhaust system by 1/4 to 1/2-inch to increase your horsepower. However, any additional increase in pipe diameter is likely to decrease your performance; specifically, low end torque. 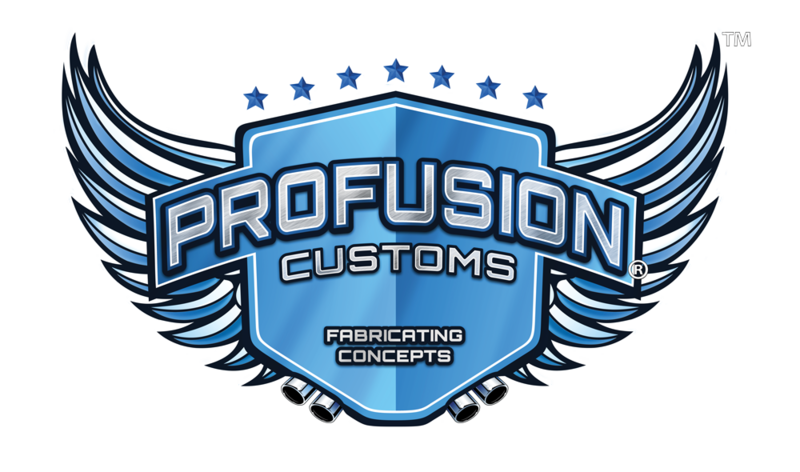 If you didn’t find the answers you needed on this page, please send your questions to us at:info@profusioncustoms.com, or call our Tech Line on (+44) 01753-686878 and one of our MagnaFlow tech staff will help you. Do you have silencers for your mufflers? The only silencers that we have available are already included in the muffler. Silencers are not available separately. Millions of mufflers have been sold and just as many satisfied customers, Our mufflers will provide a deep, throaty but smooth tone at all RPM’s. At idle and cruise speeds it will not be much louder than stock in most cases. But step on it, and it will become more aggressively toned, while not becoming overbearing and keeping the passenger compartment drone to a minimum. There is no difference in sound between the round or oval muffler. The only reason they are different shapes is for fitting reasons. One may fit better than the other. A smaller muffler is going to give you a much louder sound than you would normally get with a larger muffler. The larger or longer the muffler, the less sound you will get. The smaller or shorter the muffler, the more sound you will get. What's the difference between Stainless Steel and Aluminised Steel? The main difference between the two is pricing and the outer shell of the mufflers. Stainless Steel cost more than Aluminized Steel. The Stainless steel mufflers have a polished stainless steel shell and are 100% stainless construction. Again, stainless steel is better looking and will never rust; nothing looks better or lasts longer than stainless steel. The aluminized mufflers have stainless internals and necks but have an aluminized outer shell. Also, the aluminized steel has only a protective coating which when scratched off tends to rust. Both mufflers have identical internal construction and materials and both offer you a lifetime warranty and will give you that straight-through wide open performance with no restrictions. No restrictions equal to better flow, and better flow equals more horsepower. Answer: No matter what your tip is made of (chrome, stainless steel), eventually, it may discolour. Why do they discolour? During the final polishing process, the compound that is used to polish the metal (which is actually comprised of other metals ground into fine particulates), becomes embedded in the microscopic pores of the tip. Eventually, these fine particulates from the compound oxidize and change colour, giving the tip a yellow/gold appearance. This is accelerated with heat and with exposure to harsh climates. In some cases, the tip may turn blue, which tends to be from heat. Some vehicles, especially modified vehicles, see increased exhaust temps as a result of their modifications. Even if the vehicle is not modified, some vehicles simply produce more heat than others and single walled tips are especially susceptible. Why? Because single walled tips lack a thermal barrier. As a result, the entire tip is directly exposed to a great deal of heat which accelerates oxidization. Which do you choose? Chrome? Stainless? Single walled? Double walled? Whether you choose chrome or stainless, some polishing and maintenance will still be needed in order to keep the tips looking fine. A single walled tip is cheaper than a double walled tip, this is why many manufacturers use these tips on their cat backs; it keeps costs down. MagnaFlow prefers to use double walled tips because they keep their appearance longer. Does the tip affect performance or power? No. There is virtually no affect on power, no matter what tip you use. There are some tips that feature resonators built in, which amount to little more than some additional louvers in the inside of the tip. This may help to reduce noise, but only slightly. How do you fix discoloration? Generally, ALL tips need to be cleaned like any other polished component of your vehicle. Yes, we offer a lifetime warranty on all our MagnaFlow Products with the exception of our XL series mufflers/exhaust, catalytic converters and our titanium performance exhaust, which offer a limited warranty. For more information on MagnaFlow’s Lifetime Warranty click HERE. What is an X pipe? The X pipe is used to increase horsepower and torque, the positioning of the pipe is imperative to the results. What is a Y pipe used for? Generally to split the single exhaust pipe to create a dual affect. How much does a custom build exhaust cost? In theory not much more than a direct fit, but for an accurate quote it would be necessary to see the setup required, many factors can affect the price, so call now for advice.